Striker scored a hat-trick in 3-1 win for his side at the Etihad. Yelling out “Agüero” as a ‘doctor’ examines him, someone has posed in an Arsenal shirt, lying in a hospital bed after the club’s 3-1 defeat at Man City on Sunday. Sergio Agüero scored a hat-trick for the home side at the Etihad as they brushed Unai Emery’s team aside in pursuit of their title challenge. 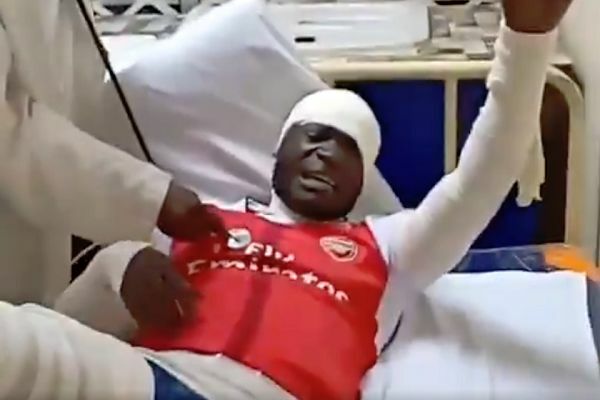 Following the final whistle, a contrived video emerged of a man wearing an Arsenal shirt, strapped up in bandages while somebody in a white coat attends to him. Each time he’s touched with a stethoscope, the supposedly in pain fan calls out the striker’s name. The clip was uploaded by a user who describes themselves as a Chelsea supporter and student nurse in Kenya.